I answer more of your questions including sports, Iconoclasm, prices, symbols, literature and more. Speaking of Byzantine symbols, I recall reading somewhere that another common symbol for the Empire and/or Constantinople would be the crescent moon and that Mehmed II later appropriated this symbol to symbolize the Ottoman Empire in 1453. Is there any basis in truth to this or is it just a myth? It does seem that this symbol was used to represent ancient Byzantion, and there are a few painting that seem to corroborate it being used in Byzantine times, but I am still unsure. Happy Saturalia and a happy 2017! You’ve earned it with your immense dedication to the podcast, Robin. Excellent episode as always. I was wondering, where did you find your pricing data for this episode? I’m interested in looking through the sources get a snap shot of the day to day economy. I have have a question about an episode about Constantine V. You said something about him having leather coins manufactured. Can you provide references for that? I’m an historic reenactor and professional leather artisan, and would love to see some photos, if there are any, so I make a reproduction. Thank you much for the fantastic podcast! As you can tell from my question, I’m a latecomer to the show. Hi, yes while besieging Constantinople, Constantine paid merchants with leather replicas of real coins which they could later redeem for real ones. I assume none survived but you could model replicas on Constantine’s surviving metal coins. The only book I know that discusses the coins is the “Catalogue of the Byzantine coins in the Dumbarton Oaks Collection.” I hope that helps. For the guy asking about polo, here’s a good short article: https://byzantinemporia.com/blog/polo-game-of-kings/. 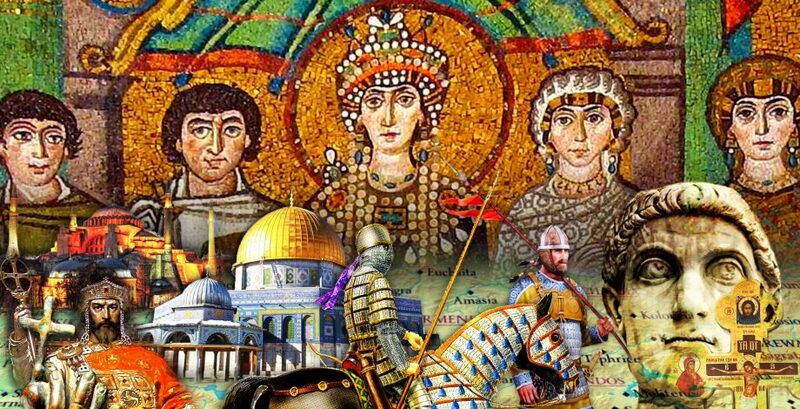 It doesn’t really go into Byzantium as much, but focuses on the role it played in nearby civilizations. Forgive me if this has already been pointed out, but I noticed that sometimes you mention pews in connection with Byzantine churches (for instance, when some men jumped from their pews to point at the supposed ghost of Constantine V riding out of his tomb). In fact Byzantine churches (and I believe Christian churches in general, east or west) did not have pews. The nave would be an open space where the congregants stood. The elderly or infirm might have chairs at the side but the worship space was not pervaded by rows of benches.